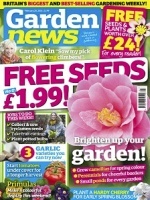 Since 1958, Garden News Weekly has been bringing tried and tested advice to keen gardeners, along with the latest gardening news from a team of trusted, knowledgeable experts. One of the fastest growing titles in the UK thanks to its down to earth and friendly style, Garden News is the perfect magazine for every gardener. Featuring advice on how to grow and maintain the perfect garden, and covering everything from bedding plants to fruit and vegetables, Garden News is a must have magazine. You’ll also find regular money saving offers and packs of free seeds. Get your subscription today with free delivery direct to your door and make sure you never miss an issue. Brighten up your garden – grow camellias for spring colour; perennials for cheerful borders; small ponds for every garden… Plant a hardy cherry for early spring blossom… Three garlic varieties you can try now… Start tomatoes under cover for a longer harvest… Bluebell heaven – make them work in your garden, plus where to find them in the wild… Colourful crops – step by step beetroot sowing… Carol Klein’s guide to growing tulips in pots… Fuss free exotics – hardy plants with sizzling tropical looks… Success with orchids – your complete guide to looking after them… Order your Garden News subscription now for more horticultural features and advice like this every week. Who Reads Garden News Magazine? Hands-on gardeners who are not afraid to get dirt under their fingernails to create the garden of their dreams.